Bone cancer refers to the type of cancer which affects and originates in the bone. It is not very common and can affect any bone in the body. The more commonly affected bones are the long limb bones. 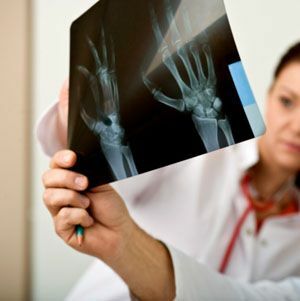 There are various types of bone cancers, some affecting adults, and some primarily affecting kids. Cancer which has originated elsewhere and spread to the bone is not termed as bone cancer, but named for where it began, such as breast cancer metastasized to the bone. With the progress of bone cancer, several symptoms as represented by the most obvious pain would occur. These symptoms may also be the result of such conditions as arthritis, osteoporosis or injury. If necessary, consult your healthcare provider for more accurate diagnosis of these symptoms so as to get the proper treatment. Bone Pain: The most common symptom of bone cancer is bone pain. It may be present only during night or when active, initially, but grows as the cancer spreads or tumor grows. The pain can be a dull or deep ache in the bone or the entire area like back, pelvis, legs etc. The pain starts becoming persistent as cancer spreads. Fractures: The cancer can cause the bones to become weak and fragile. This can lead to fractures in the area where bone pain or swelling is experienced. Decrease in mobility: Due to prolonged pain or pain near joints, there can be difficulty in moving around or doing day to day activities. Swelling: The location where bone pain exists might show swelling or presence of a lump or mass. Other: There might be weight loss and fatigue along with bone pain. If the cancer has spread to other organs, there can be difficulty in breathing as well. Bone X-Rays: Taking an X-Ray involves exposing the body part to a small amount of radiation against a film which takes pictures of the bone. It helps the doctor in diagnosing and treating any medical condition. Bone Scan: In this procedure a mild radioactive substance is injected in the body through a vein. A scan is then taken for the bones. Any abnormal part of the bone absorbs more radioactive substance and thus shows up more clearly on the scan. MRI: Magnetic Resonance Imaging is where magnetic energy builds pictures of the body tissues. It can be done for any part of the body and sometimes an injection is given prior to the scan to highlight certain parts of the body. Bone Biopsy: For a biopsy, a small part of the bone is taken and checked for cancerous cells using microscope. With the help of local anesthesia or sedation, a needle is pierced into the bone to collect the part. The treatment for bone cancer will depend on the type of cancer, the stage and the overall health status of the patient. The 3 options are Surgery, Radiation and Chemotherapy. The aim of surgery is to remove the cancerous part from the bone along with some healthy tissues surrounding it. When the bone cancer has spread, there may be requirement to remove the entire limb (amputation). However, with advancement of technology, this is being avoided. The cancerous tissue is removed as far as possible without removing the limb. Bone parts are replaced with bone from other part of the body or artificial prosthetics. Some area surrounding the bone may also be removed, preserving the bone as much as possible. This is applicable to bones of the limbs or other parts of the body like the ribs or the spine. Radiation therapy involves using high energy rays like X-rays to kill cancer cells. While the patient lies supine, a machine sends precise energy beams to targeted body parts. Radiation is usually used along with chemotherapy, before surgery to reduce risk of amputation and after surgery to kill any cancerous cells that are left behind. It is usually helpful for people who cannot opt of surgery. Chemotherapy involves injecting drugs intravenously to kill the cancerous cells. The medication travels throughout the body and is usually administered along with radiation therapy. It is administered prior to surgery to reduce the size of the tumor and make it more manageable to remove. It is also used in bone cancer when it has metastasized to other tissues.